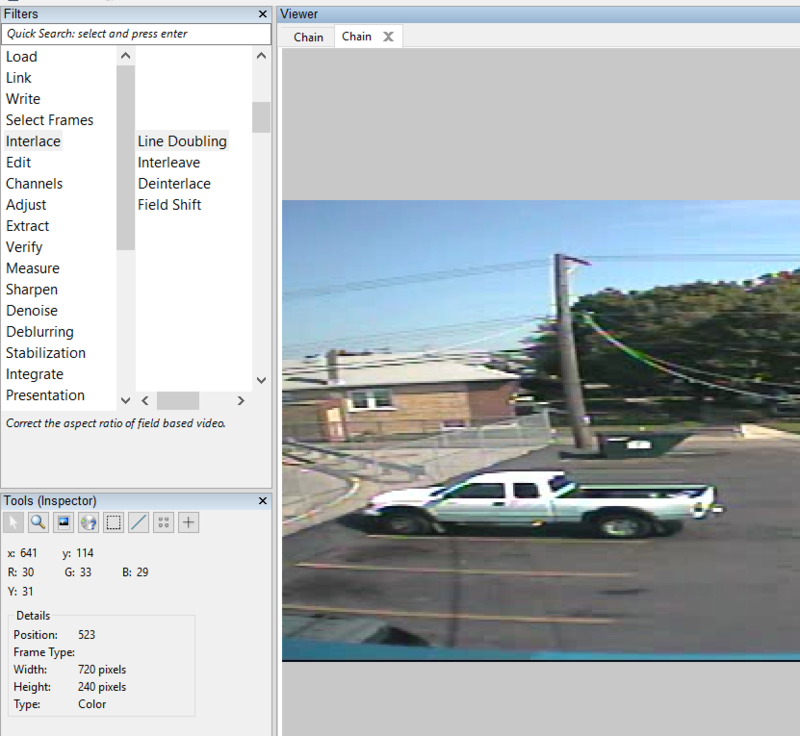 It starts at the scene when a person matches analog cameras with digital CCTV systems that record in resolutions designed to maximize hard drive space (like 704×240 / 720×240) . What do I mean by this? An NTSC analog video picture is composed of 480 active horizontal lines. When the picture is sent to a monitor or another receiving device, the first field of 240 even-numbered lines is sent, and then the second field of 240 odd-numbered lines is transmitted. This occurs at a rate of 60 fields per second. What’s the big deal? When these interlaced fields (analog) are sent to a DVR that records in 2CIF resolution, for example, the DVR discards (doesn’t record) alternative fields. It may record Field 1 but not Field 2. Thus, every other line of resolution is not recorded. This is how you end up with a resolution of 704×240 / 720×240 instead of 704×480 / 720×480. The solution to this problem is actually quite simple in FIVE, just use the Line Doubling filter. With the Line Doubling filter applied, the image’s horizontal resolution is restored. 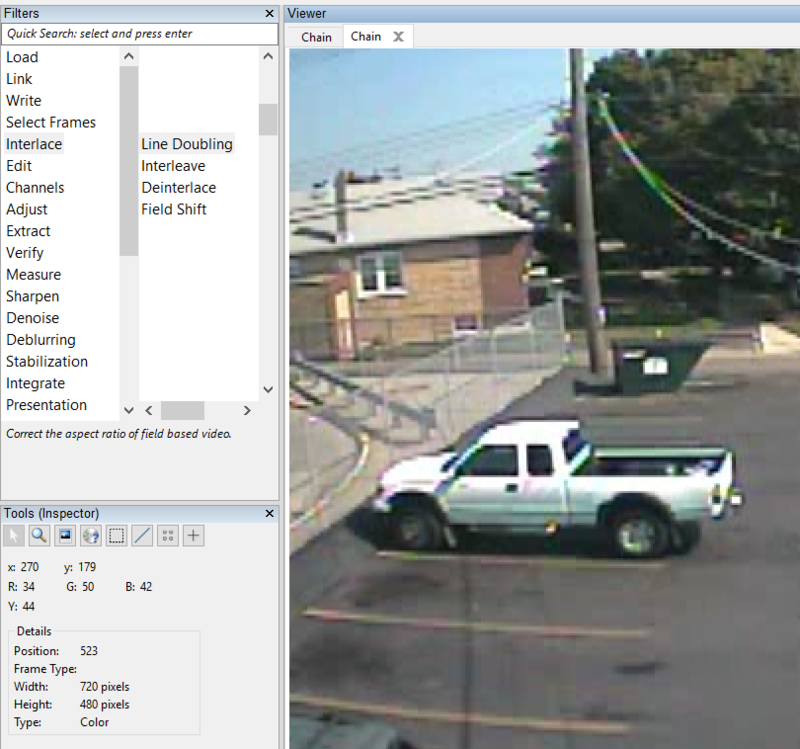 We can now see the truck correctly. We’re really not looking for a stretched truck after all. What did we just do? 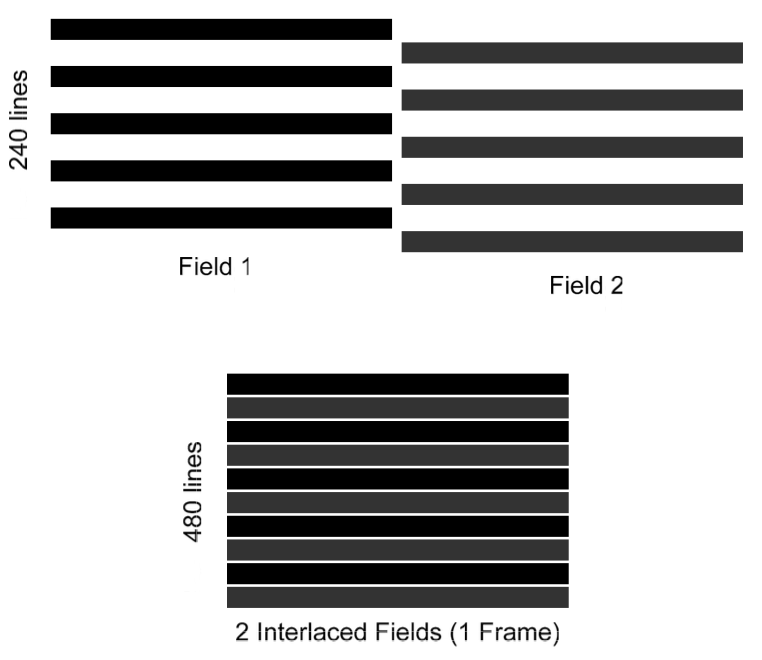 Line Doubling corrects / restores the aspect ratio of field based video. The Line Doubling filter doubles the height of an image which appears vertically squeezed because of an incomplete deinterlacing process or other issues in the encoding / decoding. Only one line in every two will be interpolated, while the others will be kept at the original pixel values. Don’t worry about memorizing how the filter works, just read the report. Line Doubling is one of the many “one click fix” tools in FIVE. FIVE’s over 100 filters and tools are there to assist even the most complicated restoration / clarification / analysis tasks. If you’d like to know more about our amazing tools and training offerings, contact us today.